The African elephant is the largest land animal on Earth. Their herds wander through 37 countries in Africa. Their species appeared about 1.5 million years ago. 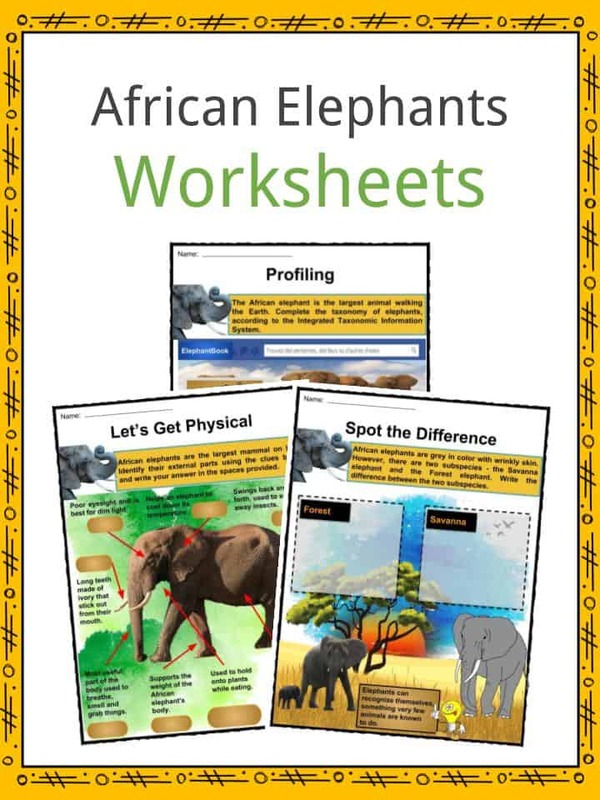 See the fact file below for more information on the African elephant or alternatively, you can download our 28-page African elephants worksheet pack to utilise within the classroom or home environment. The word ‘elephant’ has both Greek and Latin origins. 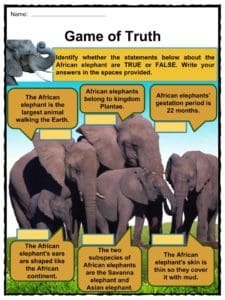 This applies specifically to the elephant’s scientific genus name “Elephas”. In Greek linguistics, elephos represents an antlered beast or stag. The roots of the word elephant in Latin is divided into two words: “ele”, which means arch, and “phant”, which means huge. The genus name, Loxodonta, for the African elephant means lozenge-shaped teeth and describes the chewing surface of the teeth. African elephants can grow 8.2 to 13 feet (2.5 to 4 meters) from shoulder to toe and weigh 5,000 to 14,000 lbs (2,268 to 6,350 kg), according to the National Geographic. The African elephant can be identified by its ears which resemble the shape of the African continent. Heat radiates from the elephant’s massive ears, which have many veins, acting as a cooling mechanism. An elephant’s skin can be as thick as 1 inch, but it is sensitive to the sun. To protect it, elephants cover themselves with mud or dust. An African elephant’s trunk is actually a long nose used for smelling, breathing, trumpeting, drinking and also for grabbing things — especially a potential meal. Female African elephants start reproducing at around 10 to 12 years of age. They are less likely to reproduce in times of drought than when water is plentiful. They also do not mate at a specific time of year. The fertile females usually give birth every 3 – 6 years. Elephants have a longer pregnancy than any other mammal – almost 22 months! At birth, baby elephants already weigh around 200 pounds and stand about 3 feet tall. Savanna elephants are larger than forest elephants, and their tusks curve outwards compared to forest elephants, which have straighter tusks that point downward. There are also differences in the size and shape of the skull and skeleton between the two subspecies. Forest elephants, also called call Loxodonta cyclotis, are a distinct subspecies of African elephants. They are uniquely adapted to the forest habitat of the Congo Basin, such as being smaller in stature and darker in color. They also tend to have small, rounded ears. It is estimated that probably one quarter to one third of the total African elephant population is made up of forest elephants. They are in sharp decline because of poaching for the ivory trade and deforestation. 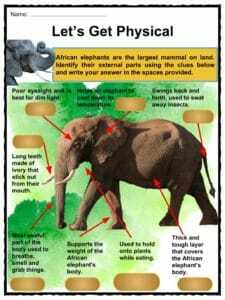 African elephants are heavy and powerful and need hundreds of pounds of vegetation daily to sustain its massive size. An adult elephant can consume up to 50 gallons of water and 220 lbs (100 kg) of food every day. Their main food is fruit but they also consume grasses, small plants, bushes, twigs and roots. 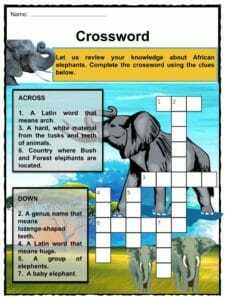 The majestic African elephant occupies many areas of Africa. They live in large groups referred to as herds. They prefer settling in regions where there are is abundant water. 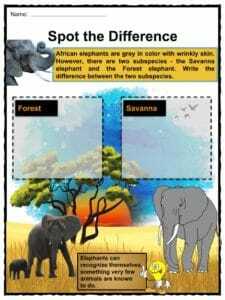 The African savanna elephants roam the grassy plains and woodlands of Botswana, Tanzania, Zimbabwe, South Africa and Mozambique, while African forest elephants live in the tropical rainforests of central and western Africa. The African elephants’ range has shrunk considerably in the last decades from three million square miles in 1979 to just over one million square miles in 2007, this is due to expanding human populations converting land for agriculture, settlements and development. Commercial logging, plantations for biofuel and extractive industries like logging and mining not only destroy habitat but also open access to remote elephant populations for poachers. 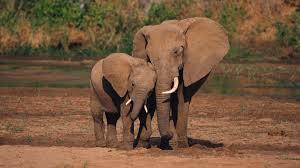 In 1980-1990, the population of African elephants was more than halved, from 1.3 million to around 600,000. 1973-1989, the African elephant population of Kenya declined by 85%. In Chad, the population declined from 400,000 in 1970 to about 10,000 in 2006. In Tanzania’s Selous Game Reserve, once the largest of any reserve in the world, the population dropped from 109,000 in 1976 to 13,000 in 2013. The government of Tanzania estimated that more than 85,000 elephants were lost to poaching between 2009 and 2014, representing a 60% loss. The illegal demand for ivory is the biggest driver of elephant poaching. 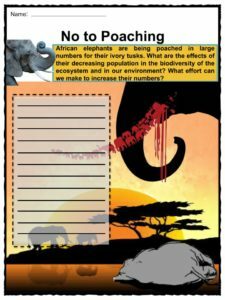 In 1989, CITES (Convention on International Trade in Endangered Species of Wild Fauna and Flora) banned international trade in ivory to fight the massive illegal trade. After the ban came into force in 1990, major ivory markets were eliminated. Conflict between elephants and a growing human population are a major issue in elephant conservation. Nature reserves have a hard time containing bull elephants, who like to wander vast distances and easily break through perimeter fences. To reduce the illegal killing of elephants through improved protection and management, WWF equips and trains law enforcement teams so they can conduct regular and effective anti-poaching patrols. In countries such as South Africa, where elephant populations are growing, too many elephants can also pose a threat to the environment as they have destructive eating habits. The African elephant usually sleeps standing up. They sleep an average of two hours every day, usually broken into several episodes. Elephants make powerful low-frequency rumblings to communicate over long distances. Baby elephants are dependent on their mother’s milk for the first 2 years of life. Structures in the elephant brain are strikingly similar to those in humans. After a death, elephants family members show signs of grief. Instead of losing baby teeth one at a time like us humans, elephant teeth move from the back of the mouth, like a conveyor belt, to push out and replace front teeth. 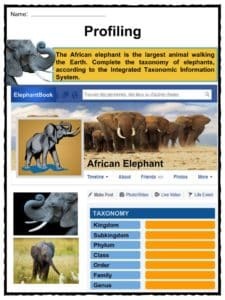 This is a fantastic bundle which includes everything you need to know about African Elephants across 28 in-depth pages. 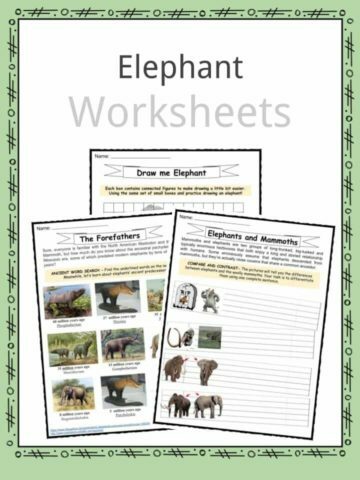 These are ready-to-use African Elephants worksheets that are perfect for teaching students about the African elephant which is the largest land animal on Earth. Their herds wander through 37 countries in Africa. Their species appeared about 1.5 million years ago.